FILE - A truck carrying goods arrives at Kerem Shalom crossing in Rafah in the southern Gaza Strip, Aug. 15, 2018. Arab media reported that Israel began allowing trucks to deliver various goods into Gaza through the main Kerem Shalom border crossing, after a visit Wednesday by Egypt's intelligence chief, Abbas Kamel, to negotiate a prisoner swap with Israeli officials in Tel Aviv. Egyptian media noted officials of the Palestinian Hamas group are expected to visit Cairo within the next 24 hours to deliver the group's response to the proposed Egyptian-sponsored deal. At the same time that Egyptian mediators were trying to reach a deal between Hamas and Israel, Palestinian Authority President Mahmoud Abbas appeared to shut the door to any new attempt at a reconciliation deal between the PA and Hamas mediated by Egypt. FILE - Palestinian President Mahmoud Abbas, center, speaks during a meeting with top decision-making body the Palestinian Central Council, at his headquarters in the West Bank city of Ramallah, Aug. 15, 2018. 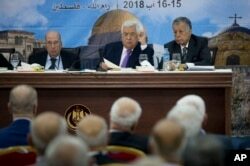 Abbas told his Fatah faction during a two-day meeting in Ramallah that there can be no inter-Palestinian reconciliation agreement outside the comprehensive deal agreed upon last year, in which all factions unite under the same government, the same security forces, the same laws and agree to the abolition of militias operating outside the government. Egyptian analyst Said Sadek tells VOA that Egypt has not given up on an inter-Palestinian agreement, alongside deals between Hamas and Israel. "All these negotiations are concentrating on several issues," Sadek said. First, "reconciliation between Fatah and Hamas; second, cease-fire [between Hamas and Israel]; third, the exchange of prisoners and bodies, along with the fourth, which is the so-called 'Deal of the Century.'" Sadek stressed that regional players, including Egypt and Saudi Arabia, appear to be trying to work out details of the Trump administration's Arab-Israeli peace plan, which Arab media has dubbed the "Deal of the Century." But Abbas told his Fatah faction's leaders that he was the first to oppose the Trump administration's Deal of the Century and would continue to do so. The Trump administration's Middle East peace envoy, Jason Greenblatt, indicated in a tweet Wednesday that "no one will be fully pleased with our proposal, but that is the way it must be if real peace is to be achieved." "Peace," he added, "can only succeed if it is based on realities." Egyptian President Abdel Fattah el-Sissi met with Saudi King Salman and Crown Prince Mohammed bin Salman in the Saudi town of Neom several days ago amid reports that they had discussed the Trump administration's peace plan, in addition to the conflict in Yemen and economic efforts by Saudi Arabia to develop its Red Sea coast.